Change is inevitable in life and can come upon us gradually or like a storm at sea. Whether it’s a welcome change to smoother sailing or a squall that must be weathered, the bright, yellow blooms of the daffodil flower are a great way to mark the changing tides of life. These springtime blooms are rich in symbolism and the perfect flower to help remind anyone switching careers, leaving a relationship, retiring after many years or moving apartments, that changing the course of one’s life is the only way to grow. Beginning as a bulb planted when the autumn leaves begin to fall, the tiny green tips of daffodil leaves begin to peek out from the snow in early spring after months in the frozen ground. Surprising us with their tenacity, the nodding heads emerge and open to sun their faces in March and April. As blooms fade and leaves die back, these flowers go dormant in the summer only to begin the cycle again in the fall. Said to represent rebirth and new beginnings in the language of flowers, the daffodil is the perfect reminder that good or bad, nothing in life is permanent, which allows us to continually be surprised and delighted with what each new season holds. The flower comes in a range of lemony yellows from the palest, nearly-white to a deep orange gold. There is a central bell-shaped cup in the middle, often called the corona, with surrounding flattened petals of a lighter shade. The stems are hollow with a tiny, papery brown collar. Holding a daffodil, one is surprised that something so dainty can force its way through the cold and snow to bloom each spring. Sold in bunches at local florists from February until early May, daffodils are an outstandingly economic choice for a small vase or fresh bouquet. Due to their seasonality, these buttery blooms are often less than $5 per bunch. With bloom sizes ranging between 3-4 inches, a handful will look amazing in a short, round vase or a taller, fluted one that allows the blooms to spread out a bit. 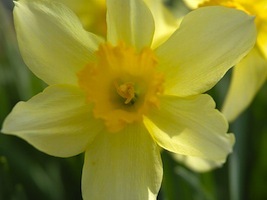 The story that surrounds the naming of the daffodil gives it its Latin name, Narcissus. Said to be the embodiment of a youth with whom Aphrodite was enamored, the young man was transformed into this flower to save him from drowning. In other cultures, the daffodil is present at New Year celebrations to encourage luck and good fortune in the times to come. Whether sailing off into the sunset or on to uncharted waters, celebrate the ebb and flow of life with these beautiful spring blooms.